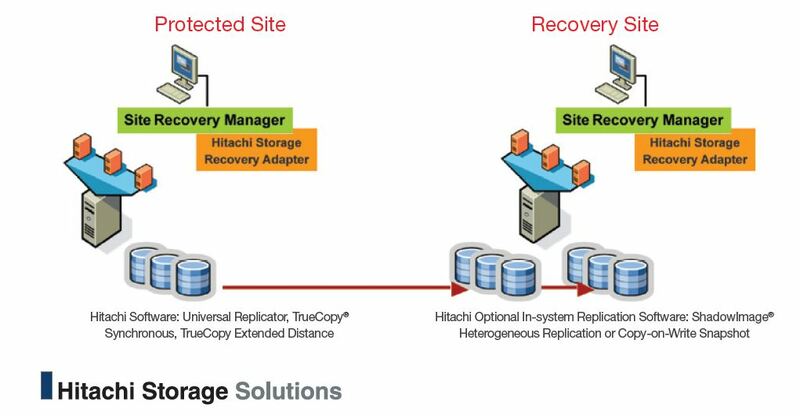 This post is about Site Recovery Manager (SRM) in combination with the storage system of Hitachi Data Systems (HDS). I’ve been working with over the last couple of months. This is a braindump of my knowledge about the product. HDS has complete portfolio of storage solutions available. Every type of VMware environment can find a HDS solution suited for their needs. I’ve been working with the AMS2500. This is a SAS / SATA based storage array. It is a suitable solution for midrange size companies, but can also be used by enterprise size companies as a 2nd tier SAN. Next to this storage array HDS also provides enterprise class storage array with its Universal Storage Platform. For both types of storage HDS provides best practices for VMware which can be found here for the AMS2000 series and here for the Universal Storage Platform VM. Like all major storage vendors HDS also is a VMware partner when it comes to SRM. They committed themselves to the support of their storage systems with SRM through their HDS SRA 2.0. For more information how to set up VMware SRM with HDS storage arrays take a look at the deployment guide here that HDS created. It’s a document that explains in detail how to setup your HDS storage array and HDS Storage Replicatoin Adapter (SRA) for the creation of your SRM environment. For more information on HDS with VMware look at this resource page.